You can scan an image to your computer using your product's control panel buttons. Select a scan option and press the OK button. 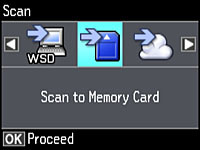 Scan to Computer (JPEG) saves your scan file directly to your computer or as an image capture in OS X .
Scan to Computer (PDF) saves your scan as a PDF file to your computer or as an image capture in OS X.
Scan to Computer (WSD) lets you manage wireless scanning in Windows 10, Windows 8, Windows 7, or Windows Vista (English only).